MENIFEE, CALIFORNIA.  Randy Warner is the first to admit how idiotic it is that he lives with 27 Dalmatians. They sleep together, eat together, watch TV together. The follow him like the Pied Piper through his tiny house they share in the country near Riverside. Since his van broke down months ago, theyve been apart just twice a week  the two days when Warner steals a few minutes to squeeze through the pack, out the door and down the driveway to the wooden polka dotted dog for a mail box to check for letters and contributions. At 44, Warners every waking moment is consumed by this speckled breed. They are the reason he left his high paying job in computer programming years ago to run his Dalmatian ResQ effort full time, finding good dogs good homes. Call it noble  call it lunacy. But before you put any label on this man, consider that an estimated 12,000 Dalmatians last year alone wound up in pounds just in the LA area. Many of them had owners who tried to beat their hyperactivity out of them. Still more had their births timed by money-hungry backyard breeders to coincide with the Disneys 1996 live action 101 Dalmatians. The wound up in homes around the area as little cute playthings for kids, only to end up today adult dogs starving for attention in a world that doesnt understand them and all too quickly puts them to death. As if the word isnt enough, hes bringing three of his own Dalmatians and 21 others hes currently sheltering to the festival area north of Sam Boyd Stadium on Saturday to support this weekends Pet Adopt-A-Thon. As part of National Pet Week, about 80-100 dogs and cats from Dewey Animal Care Center, Henderson Animal Shelter and Nevada Society for Prevention of Cruelty to Animals will be up for adoption. All will be bathed, groomed, vaccinated, spayed or neutered and available for as little as $13  almost four times less than the average shelter adoption fees. Out of respect for the local shelter dogs needs, none of Warners Dalmatians will be available for adoption Saturday. Private arrangements can be made to meet his dogs by calling the office..
Every year, 10 million dogs are being put to death and it doesnt have to be that way. Warner who got a ride to Las Vegas courtesy of Saturn of West Sahara on Wednesday morning, said. And it was no easy feat by any stretch of the imagination. With a Sun reporter along for the ride, driver Dominick Gaudio made the four-hour trek south to Warners tiny house in Menifee, a ways off the Interstate 215 amidst seemingly endless miles of mustard flowers. The van was backed to the front door, opened and in a flash was filled with a frenzied pack of barking dogs, their leashes on, leaping over the seat backs in a race to get a window seat. It was a moment Warner had been stressing over longer than a week. The ride proved to be exceptional  the dogs dozed and calmly watched out the windows, not realizing that their presence in the van seats was causing all sorts of commotion by the passers by trying to count the number of spotted dogs in the seats. Warner finally got to leave his house for the first time in months and within four hours all dogs were safely stowed away at the home of host Ann Harringtons back yard. Harringtons group Media Partners for Pets is sponsoring the Adopt-A-Thon along with Veterinary Centers of America. There are also the accounts of the four times he was thrown into jail for keeping too many animals in his home. No account in any way of abuse, neglect or abandonment, just simply did not have the proper license from the county which charged several thousand dollars for the permit. And then, there are the first place trophies from the St. Patricks Day Parades, won by dozens of his green-spotted dogs. The walls also hold the anger that sends Warner into a rage each time he mentions the callous, stupid shallow excuses he gets from people who adopt dogs because theyre cute and ditch them in the pound months later. Or the people who call him up claiming to want a playmate for the Dalmatian already in their home, only to further request an unsprayed female and proudly admit they are planning to breed for money. 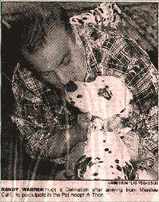 Dalmatians can bring upwards of $1,000. That is what makes the bond at the pound so intense  the dogs tails wagging, the licks and sometimes even peeing in excitement  they just know youre saving them from death and they really appreciate it. I can see Thank You, Daddy in every one of these faces and that makes me get this overwhelming feeling of pride, joy and accomplishment, he said, looking around the van at all his children as he calls them, some of them nuzzled together on the seats, others sleeping on the floor, and a few taking in the desert scenery along Interstate 15. As joyous as adopting a dog can be, though, its not a situation hes asking just anyone to try. Hell never adopt any of his dogs to anyone under 26  statistics show that 80 percent of all dogs will suffer at least one severe beating and countless hours of neglect in the homes of young unmarried men. The majority of these dogs survive the beatings, but they are the faces that end up in the pounds and often severely traumatized. When you take a dog, youre making a commitment for 15 years. If you re 21 or 22, you are not qualified for a dog, he said. First of all, that is the time they should be out discovering life and all it holds before them. Being tied down to a dog is not something they truly understand till its too late. I dont care how many dogs youve had before  experience certainly does not equate success. Dont adopt a dot until youve settled into your life, you know where you are going, where youll be living, have a steady job and even know who you will be spending your life with. Way too many dogs and cats are relinquished because the new mate isnt fond of that pet or may have jealous issues with it. You cant decide six months after adopting a dog, to become a flight attendant or join the FBI. That is not a lifestyle for a dog. And a dog living alone isnt fair either. When youre at work 8-10 hours a day, you come home exhausted, that dog is there and he/she just lives for you, he said. Theyve been waiting all day long and when you walk in they want to play and you are exhausted. That wont happen if you have a second, COMPATIBLE dog at home to play with. Two dogs is literally half the trouble of one, he states with confidence. Warner gets by on donations and the occasional dog training he does  specializing in removing aggressive behavior and returning to their original homes. My goal in life is to go to my grave knowing that I did more than I was expected in assuring these animals can know the joy of living a long, safe and happy life. Ive literally considered leaving all this to tour the nation and try and see some form of humane education in our nations schools. Id just load up a bunch of dogs and travel the country. Id be real good at that, he claimed with a smile and a wink.